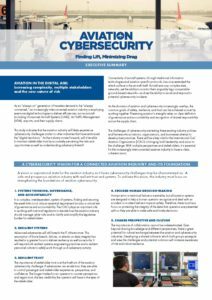 The Aviation Cybersecurity report toolkit is available in PDF format below. As an “always on” generation of travelers demand to be “always connected,” an increasingly interconnected aviation industry is employing evermore digital technologies to deliver efficiencies: across aircraft (including Unmanned Aircraft Systems [UAS]), Air Traffic Management (ATM), airports, and their supply chains. security, operations and the passenger experience—both in the air and on the ground. 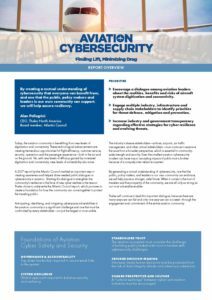 Yet, with new levels of efficacy gained by increased digitization and connectivity, new levels of vulnerability also arise. 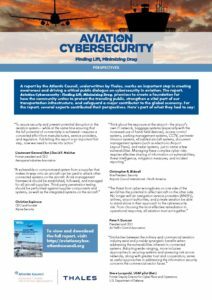 A 2017 report by the Atlantic Council marked an important step in creating awareness and helped drive needed public dialogue on cybersecurity in aviation. Starting this dialogue to strengthen the community’s resilience in the face of new cyber realities is the reason Thales chose to underwrite the Atlantic Council report, which promises to create a foundation for how the community can come together to protect the traveling public.